Located in the heart of the Mission District of San Francisco, Dianda's Bakery is a purveyor of classic Italian pastries. Dianda's brings 56 years of baking experience, passion for taste and a respect for tradition. Dianda's Bakery was opened by Mr. and Mrs. Dianda in 1962. They brought their favorite recipes from their hometown in Lucca, northern Italy. Their goal, bring a taste of Italy to San Francisco, their new home. The Dianda's raised three sons, who carried their legacy forward expanding the business to two Bay Area locations, supplying beloved baked goods to people across the Bay. Dianda's has become an institution. 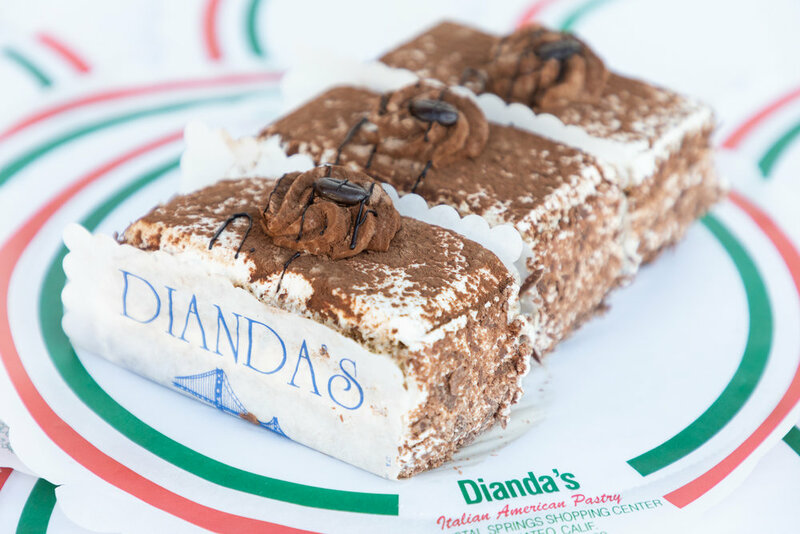 With neighborhood regulars who come in daily for a coffee and a fresh pastry, to lines that wrap around the block during the holidays to get that special cake, or a box of Italian cookies; so many of our celebrations would not be complete without Dianda's. In 2003, three dedicated employees were given the opportunity to continue the family legacy. Floyd, Luis and Sergio continue to run the bakery with the same passion, attention to detail and commitment to tradition that Mr. and Mrs. Dianda's brought with them 50 years ago. San Francisco is world-famous for a number of reasons, but one of them is certainly the stunning quality and variety of food available in this city. Standing front and center in providing dishes that are both a delight to the senses and exquisite in presentation is Dianda’s Italian American Pastry. At Dianda’s Italian American Pastry, all of our products are baked fresh daily on our premises, using the finest ingredients. With two locations feeding you seven days a week, there’s never a bad time to pay us a visit. Come on by and bring your appetite. We look forward to putting a pastry in your mouth and a smile on your face! Dianda's specializes in traditional Italian baking at it's finest. Below is a list of our most popular items. Give us a call or come by the bakery to learn about everything we are baking fresh daily. Bring Dianda's to your next event! We want to be at your next event! Celebration at your kid's school? We want to help bring the sweet to your celebration! Contact partnerships@diandasbakery.com to discuss your event. Let's make it happen! We invite you, your friends and family to make Dianda's a part of your life! Come by every day, once a week, or for special occasions. Dianda's is famous for its delicious and exquisitely designed birthday cakes. Fabulous for people young and old. Tiramisu ...to name a few. Come by anytime to preview and sample the cakes! We love working with couples to bring their dream wedding cake to life. Wedding cakes can be customized to suit your taste preferences, aesthetic style and size to make sure all your guests get to taste! Floyd Goldberg (co-owner) has been designing and making wedding cakes for Bay Area brides for over 30 years. Come in Monday-Friday between 7-10am and get a free coffee with the purchase of any morning pastry. Mention you saw this *special* on the website for your *free* coffee. Come in to either of our two locations and place your order in person. This way you can see the pastries and cakes and arrange a tasting if you'd like. Every season Dianda’s bakes unique goodies to complement the season and the holidays we all celebrate. Keep an eye on this section of the website as we will update it regularly with our seasonal treats. To celebrate St. Joseph’s Day, we will have Zeppole an Italian donut! Zeppole are fried pastries filled with a fresh lemon custard. Zeppole are best enjoyed with friend and family and a hot cup of coffee. Dianda’s FAMOUS Hot Cross Buns! Dianda’s is famous for it’s traditional Hot Cross Buns. What sets our Hot Cross Buns apart is the rich, luscious custard topping. Freshly made each day, filled with candied fruit and rich, buttery dough, this seasonal delicacy will enrich your seasonal celebrations from Ash Wednesday through Easter Sunday.